Hi, my name is Terri. I started crafting at an early age when my grandmothers taught me how to crochet and embroider on dish towels. Over the years I've tried many other crafting mediums, and have found my favorite in rubber stamping. My wonderful guy (Craig) supports me in everything I do........I'm very blessed!! I love learning new things and hopefully will inspire others to step out of their comfort zone and try a few new things. Thanks so much for stopping by....have a wonderful day! Happy New Year! And welcome to Tuesday Throwdown Challenge 422 - Winter Sparkles. Our sponsor this challenge is Sweet N Sassy Stamps. This adorable image is called Festive Penguin and is colored with Copic markers. Please visit their website to see all the awesome products they have.....you'll be so glad you did! 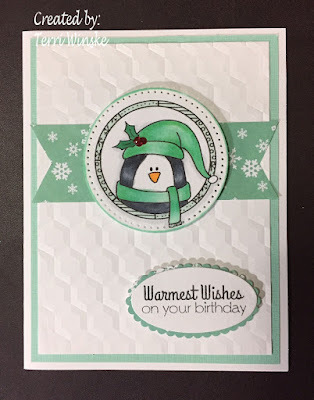 I used an embossing folder and oval die cuts from Stampin' Up and circle die cuts and a sentiment from Fun Stampers Journey on my card. It's hard to see in the picture, but he snowflakes are sparkly, compliments of a Spectrum Noir sparkle marker. I hope you check out our challenge this week to see the beautiful wintery sparkle inspiration from the other design team members and get your project uplinked for a chance to win a prize from Sweet N Sassy Stamps. Just a note - for 2019, we are moving to challenges every 2 weeks rather than every week. I'm looking forward to seeing your awesome creations! Thanks so much for stopping by and for continuing to support our challenges - we love you! !